This zone has also been referred to as the Great Bear Magnetic zone. It includes many areas of brecciation with high magnetite contents. 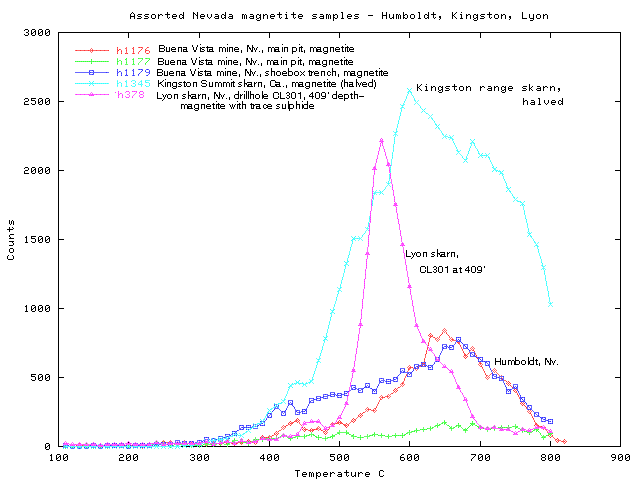 Of the 19 seperate samples supplied, 8 were split into both magnetic and non-magnetic fractions, resulting in 27 seperate analyses. Only samples from NICO were described as ore, so these were used as a basis for comparison with other samples to try to identify similarites and other potential ore areas. 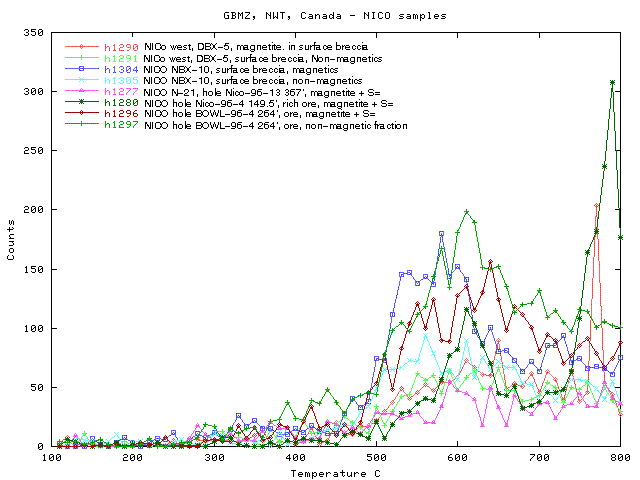 The NICO Ore samples NICO-96-4 and BOWL-96-4 show a common decrepitation peak at 610 C. For the BOWL sample this peak is present on both the magnetic and non-magnetic separates. Sample N21 lacked any useable decrepitation. (is BOWL-96-4 a deeper sample from the same drillhole as NICO-96-4???) 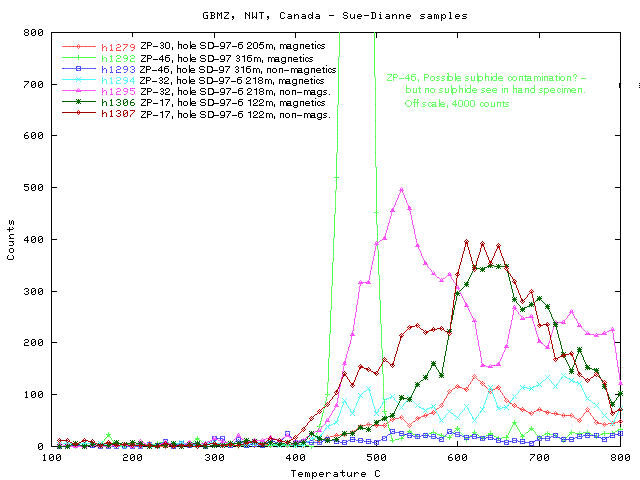 Surface sample DBX-5 shows the same 610 C peak similar to the ore samples, but Surface sample NBX-10 has a peak at 550 C and is distinct from the others. 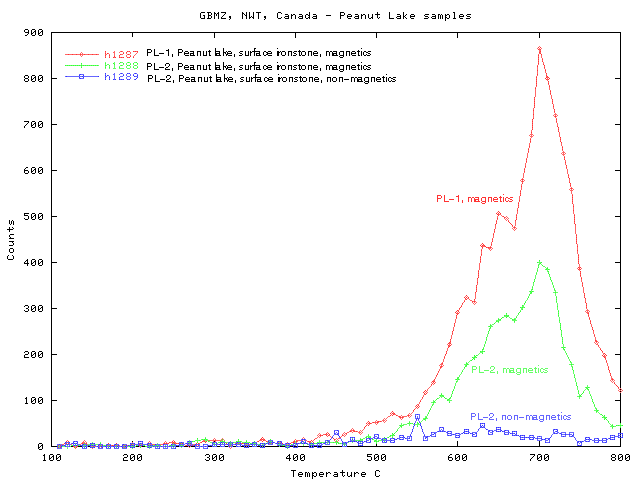 The Peanut Lake samples, despite being from the "NICO horizon" are quite different with intense, skewed decrepitation peaks at 700 C on magnetic fractions. Sue-Dianne has 4 samples from the same drillhole, but the results differ markedly and no sequence with depth is recognizeable. Only sample ZP-30 with a peak at 620 C seems similar to the NICO ore samples. Sample ZP46, magnetics, has a very narrow peak which is assumed to be due to sulphides and the sample is excluded from interpretation. However, as noted previously I did examine this sample under reflected light at *100 magnigication and saw no sulphide. I would be interested to know the precise mineralogy of this sample. 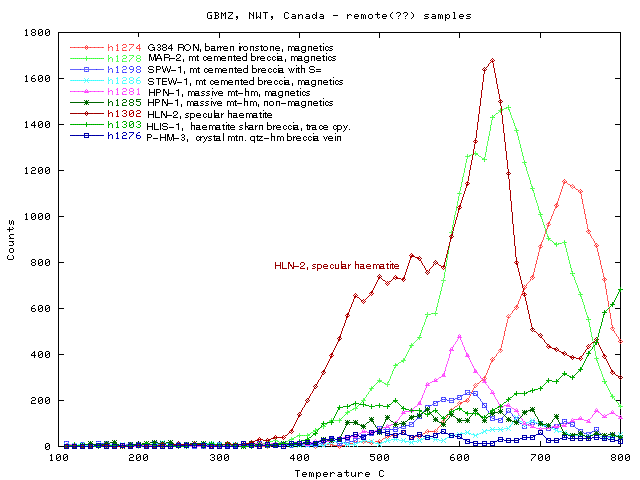 Hump Lake north and Islands samples again show differeing decrepitation responses, however HPN-1 magnetics has a peak at 600 C, comparable with the NICO ore samples. RON, MAR SPW and STEW are assumed to be distal/ barren samples and are each quite distinct. SPW1 with a peak at 610 C has similarities with the NICO ore, while RON, MAR2 and STEW show a higher decrepitation temperature from 660 C and up. P-HM-3 has a distinct quartz type response (alpha-beta inversion peak at 580 C), with only an indistinct FeOx contribution and is excluded from interpretation. Overall, the decrepitation intensity on these samples is unusually low, compared with the usually intense decrepitation on samples from Tennant Creek (NT), Upper Beaver (Ont.) and the Lyon and Kingston skarn deposits (Nv., Ca.). A decrepitaion peak at 610 C is seen on a number of samples and seems to be the most common feature in these samples. H378: Lyon skarn magnetite, Near Yerrington, Nv. 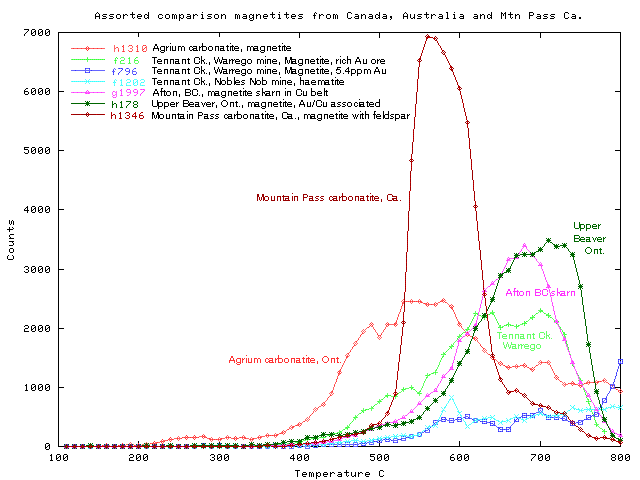 Low Cu/Au values in magntite skarn. H1310: Agrium - Carbonatite magnetite near Kapuskasing, Ont. Mined for Phosphate now. F216, F796: Tennant Creek, NT aust. Warrego was a VERY rich CU/AU mine, magnetite, chlorite, haematite host - no quartz. f1202: Nobles Nob, Tennant Creek, NT, rich Au mine, like warrego, but haematite dominant rather than magnetite. H178: Upper Beaver, Timmins district, Ont. AU mine in magnetite host, several shafts, not operational when sampled in 1993. Magnetites show lots of interesting decrepitation patterns, but its hard to be sure what these mean as, unlike quartz, no-one has documented data on fluid inclusions in magnetite. Note, some people do not think the acoustic events are caused by fluid inclusions (acoustic emission has been suggested) but I think fluid inclusions are the probable cause of the observed decrepitation events.